The Challengers Division is an extension of Foster City Little League. Children with all disabilities and abilities have the opportunity to interact in a rewarding environment. Children who require or prefer assistance may have a buddy to help them in learning the game of baseball. They will have the opportunity to bat and run the bases and play different positions in the playing field just like the Majors. Enjoy the amazing sound of the parent’s cheers as the kids hit the ball, make great plays in the field & throws to first base. The children will meet new friends and enjoy having fun at the same time. There is always a team cheer at the end of each game to show our appreciation to the other team. The environment is hard to describe in words. You have to be there to experience the thrill of your child learning the game of baseball and hearing the encouragement of the parents. 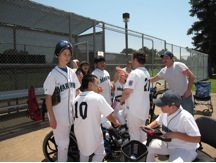 Foster City Little League provides this opportunity for all kids, in all cities, with all disabilities FREE of charge. Each player receives a full uniform along with a season schedule of games. The season usually consists of a game every Sunday afternoon except for Holidays. These games last about an hour and a half depending on how many kids show up from each team. Everyone plays, everyone hits, and EVERYONE has fun. Please come and join us this season. We look forward to showing you a GREAT time. If you are interested in signing up please contact Mark Callagy at mcallagy@arffinancial.com. See you on the field.